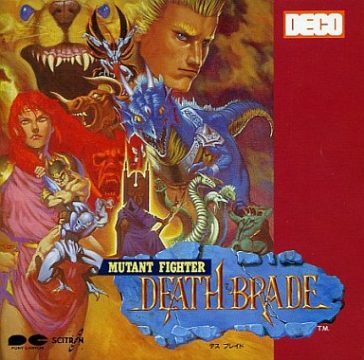 Originally released as Death Brade in Japan (we can assume this was meant to be “blade”), Mutant Fighter is a superior follow-up to Hippodrome. The ambiance of that game is improved upon, and its limp sword play has been removed completely in exchange for a wrestling tournament. 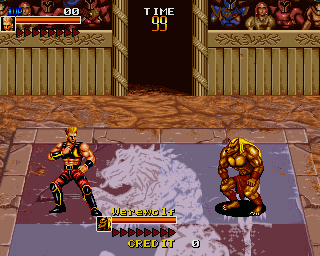 This game bears a much closer resemblance to WWF WrestleFest than its medieval stylings would make one expect. 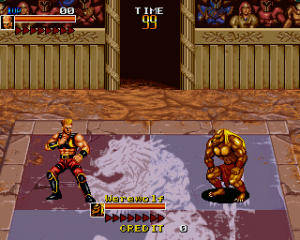 Unfortunately the format change, while making for a much better game than its predecessor, also brings with it some of the frustrations common to arcade wrestling games. 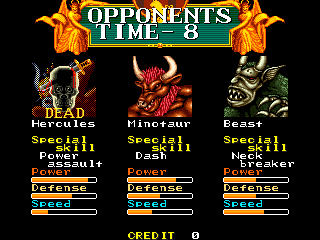 On the other hand, players do have eight cool characters to choose from, along with some even cooler bosses to overcome. Bodca is a Golem, an artificial being wearing golden armor, and the game’s generic slow-but-strong guy. Boggy, a Werewolf, is quite fast. His stocky frame, golden coat, and luxurious mane surely make him a relative of Chief War Wolf, the protagonist of Data East’s NES game Werewolf: The Last Warrior. Unfortunately he is the overall weakest character. Cindy, an Amazoness…wait, Amazon…ess? The glass ceiling must be as high as the moon in the realm of Mutant Fighter, when even an Amazon warrior is deemed a primarily male occupation! Data East’s literary length exceeds its grammatical grasp yet again. Cindy is an agile woman whose look is a bit reminiscent of characters in another Data East arcade game, Heavy Smash (a few of its backgrounds will be familiar to Mutant Fighter fans as well). She’s one of the more fun characters to use because of her flashier moves. Flea is a Beast, and looks like he was inspired by Gothic grotesques, with his voiceovers making it very clear that he is thrilled at the prospect of being able to eat brains. Unfortunately, despite his cerebral appetite, his strength and moves do little to distinguish him from the rest of the cast. Worse still, he shares the same attributes with two other characters! 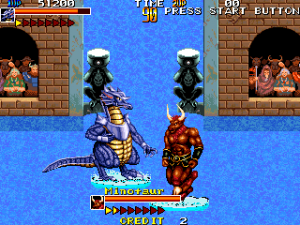 Joseph is a fire-breathing purple wrestling Dragon wearing a metal breastplate bearing his name, the coolest character in the game. Most of the roster’s super throws involves them throwing their opponent in the air and then landing on them as they hit the ground. Instead of this, Joseph dramatically grabs his opponent’s head, exclaims “FEEL THE HEAT OF MY BREATH”, and proceeds to breathe fire into their face for several seconds. His speed is lower than average, but between his being a dragon that wrestles and his fast strikes, he’s the raddest character in the game by far. Michael is a Fighter, and presumably the returning hero from Hippodrome. Regrettably, he’s just as boring here as he was there. Obsessive Data East fans will recognize his voice from Captain America and the Avengers. Fortunately, the much better looking Beast, Flea, shares his abilities, so players can use him instead. 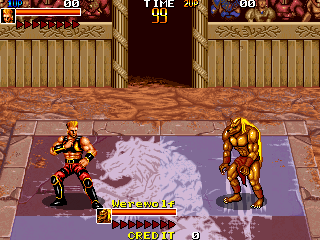 These are just the playable characters, but there are also numerous bosses. Behoroi is classified as a doppelgänger, and according to his profile, he’s only 12 years old. This is an interesting touch, given his imposing build and skeletal face. With just a little bit of extra text and animation, Data East conveys a lot of information about what a doppelgänger is like in this world. It’s really cool that they designed an entire character and profile that only appears for a few seconds before and after it transforms into a duplicate of the player. He also looks a bit like Gran, the gargoyle battled in Hippodrome. Charry is a Hydra, a large, multi-headed serpent. 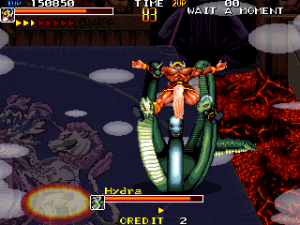 One would expect to encounter a hydra near water given its namesake, but don’t worry, Data East surprises us again by having the fight take place on an ornately emblazoned platform suspended high in the air! Charry is a great boss, with a well-animated tail, along with several heads moving around and striking independently of each other. The best detail about our airborne serpent, however, is that he not only has five heads, but five differently pitched voices to go with them! 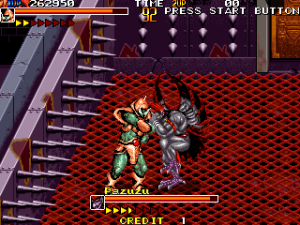 Pazuzu is a Demon who’s pretty tough, but a bit less annoying to fight than Charry. 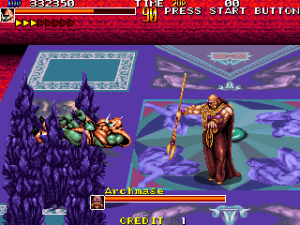 He also bears an uncanny resemblance to General Arma, a major character in Capcom’s 1994 SNES game Demon’s Crest. Maybe Data East should have sued Capcom instead of the other way around! After besting all of these foes, the final battle against Cronus begins. Cronus is an Archmage, who challenges you with the phrase “My magic is greater than your strength!” He’s also completely out of control. In a game built around grappling and wrestling opponents to the ground, Cronus uses his magic to teleport all over the arena while hurling various magical spells at the player! Good luck trying to take him down. Mutant Fighter‘s action is pretty simple to figure out. 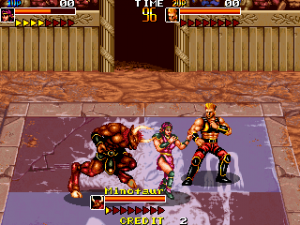 Opponents can move around and strike each other, and can also run and drive around the arena. Like any fun wrestling game, however, the meat of the action comes when characters get close enough to grapple with each other. 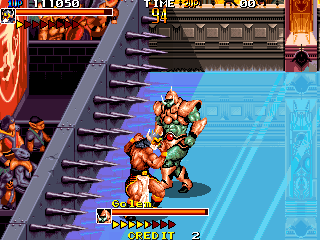 This this is also unfortunately where Mutant Fighter is at its weakest, though. 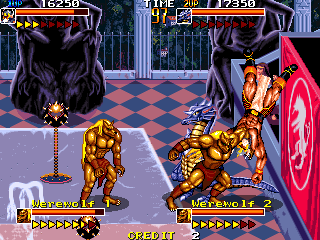 There are only so many moves in the game, with several characters being almost exact copies of each other. Even their trademark super throws are all very similar. However, the fantastical designs and unusual genre/setting combination help Mutant Fighter stand out and make it fun to fool around with, even today. The game’s soundtrack is catchy, with a fun mix of contemporary music, as well as some attempts at a more fantastical sound. There’s also a decent variety of voice samples across the game’s roster. The audio was created by regulars Hiroaki Yoshida (often credited as Maro) and Akira Takemoto (credited as Raika). 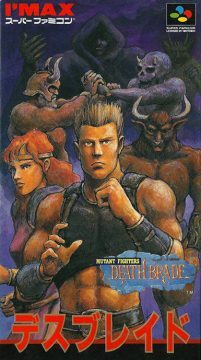 Takemoto will probably be most known to classic game fans as one of the composers for both The Cliffhanger: Edward Randy and Desert Assault. 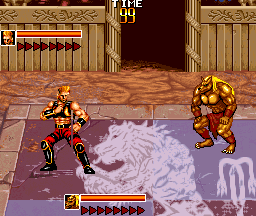 Mutant Fighter‘s graphics also present a bright improvement over Hippodrome‘s drab arenas, and along with Captain America and the Avengers, that new brightness is the result of several new graphic designers and sprite animators that joined Data East in 1990. The most prominent among them are Hitomi Fujiwara, Chie Kitahara, Wataru Oguri, and Kazunori Hashimoto. Each of these individuals played a major part in shaping how Data East games would end up looking throughout the 90s. Hitomi Fujiwara and Chie Kitahara both helped Data East keep up in the arcades, taking familiar situations from the company’s recent past and giving them a beautifully colorful new coat of paint with their animation and sprite work for Two Crude Dudes, Dark Seal II, Joe and Mac: Caveman Ninjas, and Tumblepop (as well as its many spin-offs). Oguri has a much shorter resume with Data East, but an important one as he contributed graphic design for The Cliffhanger: Edward Randy, kicking off the brighter, more visually intense graphics Data East would become known for in the 90s. He’s also partially responsible for the graphics in Captain America and the Avengers, as well serving as the art director for Data East’s final stab at the fighting game genre, Suiko Enbu Fuunsaiki. What this means for Mutant Fighter is that the end result may be a simple wrestling game, but all of that extra talent gives it a presentation that keeps it engaging. It also makes it a much more important game in Data East’s history than one would think, marking a distinct change in style for the company that can be felt even in their later cult classics like Windjammers. 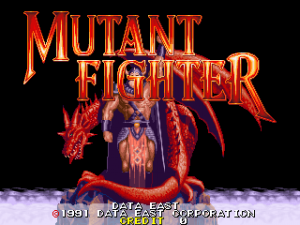 Mutant Fighter ended up being a much more popular game than Hippodrome, and while the home versions of it stayed in Japan, it found its way onto the Sharp X68000, FM Towns Marty, and Super Famicom. 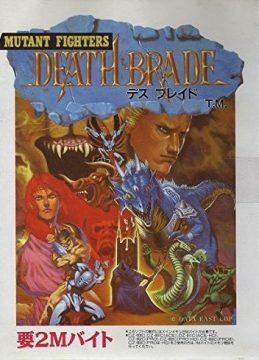 The X68000 version, ported by SPS, is the best out of the bunch. 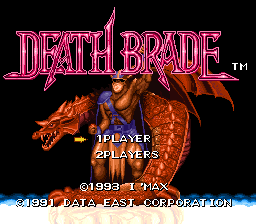 The music isn’t quite precise, and it requires quite a bit of disk swapping, but otherwise it’s a nearly perfect port. The FM Towns version was ported by Kid, and it doesn’t fare quite as well. On the surface it looks solid, but the animation is extremely glitchy, and the backgrounds are missing many details. The resolution is smaller, giving a smaller view of the playing field, and the screen only takes up part of the view on the monitor, making for lots of black space. Many of the digitized voices are missing, too. On the flip side, it comes on CD and uses a decent arranged soundtrack. It’s certainly playable overall, but it’s not on the level it should be considering the hardware. 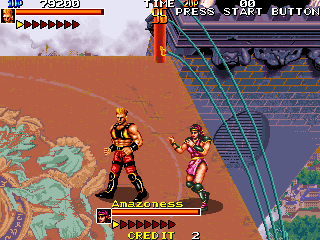 The Super Famicom version, however, is a joke in comparison to either of these ports. For starters, of the 12 characters in the game, only six of them have made it to the SFC! Players can choose from Fighter, Amazoness, Hercules, Minotaur, and Beast (oddly the fighters’ real names are only actually used in the Japanese arcade version, other releases of the game only refers to them by their ring names), and will only fight the Archmage at the end of the game, instead of his way cooler fellow bosses. 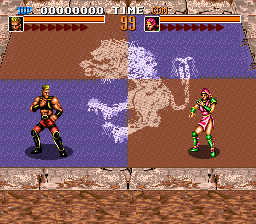 There are also only three backgrounds compared to the many variations found in the arcade version. Between half of the arcade game’s content not making the transition along with the limply replicated soundtrack, the SFC version of Mutant Fighter should absolutely be avoided.